Interactive Selection write Best Practice Recruitment Guide for games industry. 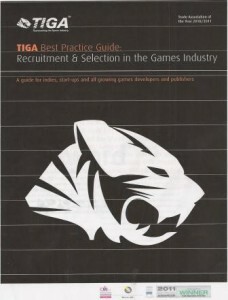 We are pleased to remind all hirers that the Best Practice Recruitment and Selection Guide for all of games industry was written by Interactive Selection and published by TIGA, the trade association representing the UK games industry. The TIGA Guide is endorsed by the Recruitment and Employment Confederation (REC). The Guide, Recruitment and Selection: Best Practice Guide for Game Developers, gives practical and informed advice on hiring new staff. The Guide also suggests ways of encouraging the best candidates to apply for jobs, looking at examples of modern practices from mentoring to flexible working to career break schemes. Exploring methods of motivation and retention, the Guide is essential reading for developers and digital publishers looking to keep employees motivated and to attract the best talent. It was written by David Smith, the managing director of London-based global games recruiter Interactive Selection, who also founded the not-for-profit network Women in Games Jobs. He was assisted by Laura Hare, the head of human resources at Jagex, Geraldine Cross, head of human resources at Blitz Games and Mark Webley, the CEO of Lionhead Studios, all of whom contributed to the Guide. Laura Hare, Geraldine Cross and Mark Webley give expert tips on planning recruitment, the interview process, investigating work permits and visas, preparing company information packs, writing job descriptions and advertising for staff. There is a heavy emphasis on equal opportunities law with input from Osborne Clarke, including a comprehensive recruitment and selection checklist, and an in-depth look at using outside agencies. “With an increasing number of development studios being formed in the UK, many will be unsure of the recruitment process and how to get the very best people to fill their positions. This guide helps to ensure they avoid any of the recruitment pitfalls, retain and respect the staff they take on and ensure that the interview process is an enjoyable and fruitful one for candidates and interviewer. The Guide is free to TIGA members and clients of Interactive Selection. Please contact Interactive Selection if you would like a copy.